Dementia, whether related to Alzheimer’s disease or some other condition, can be frightening for the patient as well as their family members and caretakers. Dementia and memory impairment can rob a person of their ability to do basic tasks and alters their personality. Many people believe that caring for these patients varies dramatically from caring for other medical patients, which to some extent is true. 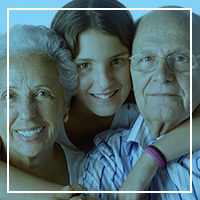 However, there are many false beliefs and myths surrounding the care of the memory impaired. 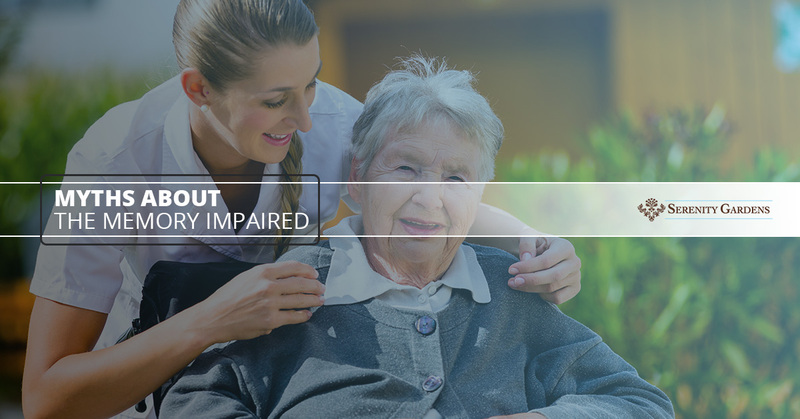 In today’s post, we hope to dispel some of these myths to help the in-home caretaker find peace or to help families with the transition to assisted living. Myth: Caring for the memory impaired is like caring for a child. Fact: The memory impaired patient is still the same person, free to make choices independently. Many people believe that as memory impairment worsens, the patient will be more like a child — requiring supervision, assistance with toileting and feeding, and constant redirection. While this is true, the adult who suffers from memory impairment should be treated as an autonomous adult, capable of making choices. When you encourage a dementia patient to make choices, answer questions, and figure things out, it helps to keep their minds as active as possible. Not only does this help slow the progression of the memory loss, but it also helps to keep them focused and occupied. Myth: It doesn’t matter what I say or do, they won’t remember anyway. Fact: Compromising standards of care is never acceptable. Many caretakers can feel frustrated or become overwhelmed from time to time. On days they are busy, they tend to rush through care or skip things altogether without worry because the patient won’t remember anyway. This belief is not only false, but getting into that way of thinking only allows caretakers to deliver subpar care, which can lead to other problems. It is unclear what a dementia patient remembers, and it is important to remember that what is expressed is not an actual reflection of what is going on in their minds. People remember much more than they are given credit for and, even when they are no longer developing short- or long-term memory, repetition creates habits. Myth: Caring for basic needs is all that is required. Fact: The memory impaired patient is a holistic being. Caring for the dementia patient should include medical care to address comorbidities as well as any new medical conditions. Care should also include assistance with basic activities of daily living — dressing, feeding, bathing, personal hygiene, toileting — in addition to providing a meaningful life. Memory care assisted living facilities understand the importance of keeping active and schedule a wide variety of activities to keep the mind and body active and stimulated. If you have a loved one who suffers from dementia, it can be a strain on you as family or as a caretaker. Fortunately there is help! Memory care assisted living facilities specialize in caring for those who suffer from dementia and other memory compromising disorders. For more information or to get the help you need, contact us today!